The market for small hybrid vehicles is still being ruled over by one particular make and model - the Toyota Prius. Still, other auto manufacturers have seen the benefits of adding these more eco-friendly vehicles to their line-ups and have been hard at work to diversify the competition. In 2017, Hyundai upped the ante with the introduction of the Ioniq Hybrid. Now, the 2019 Hyundai Ioniq is posed to be a top contender with its best-in-class fuel economy and a spacious cargo area. Since the Ioniq was just introduced for the 2017 model year, not too many changes have been made on the 2019 Hyundai Ioniq. The only alteration that is really worthy of being mentioned is that the optional SEL Tech package from the 2018 model year now comes as standard equipment on the SEL trim level. This means that the new SEL trim comes with lane keep assist, automatic emergency braking, and smart cruise control. One of the most obvious reasons that people will want to buy the 2019 Hyundai Ioniq is that its fuel economy is stellar, even by hybrid standards. The base Blue trim gets a grand total of 57 mpg in the city and 59 mpg on the highway. Meanwhile, the SEL and Limited trim levels both get 55 mpg in the city and 54 mpg on the highway. Finding another vehicle that can best these numbers will prove to be rather difficult. Another attractive aspect of the Hyundai Ioniq is undoubtedly its price tag. For a vehicle in its class, the Ioniq packs a lot of excellent standard and optional features into a competitively priced package. Not only does the vehicle itself stay at an affordable rate, its superb fuel economy will help drivers save money on pumping in gasoline. Some drivers will also find the Ioniq to be a more attractive vehicle than some of its slightly pricier competitors, giving it just one more edge. The 2019 Hyundai Ioniq is loaded to the brim with driver aids. The fact that Hyundai has shifted the features found in the 2018 model's optional SEL trim package to be standard on this year's model makes this mid-level trim a smart choice to buy. Additionally, it seems that these driver aids work well and are not overly touch-sensitive or completely unresponsive. With 26.5 cubic feet of cargo space available, the new Hyundai Ioniq outdoes other hatchback hybrid vehicles. There are some cleverly crafted storage solutions in the cargo area that help to maximize the organization of items. It is easy to fit more carry-on luggage pieces in the cargo area of the Ioniq than it is in the Toyota Prius, which has less cargo space available. Controls for the 2019 Hyundai Ioniq's features are all intuitively placed and incredibly easy to use. There is barely any learning curve, so even non-tech savvy drivers will need to spend very little time and energy trying to figure out what knob or button performs which function. The buttons are big and can be clearly read. The infotainment screen is simple to navigate and provides high-resolution graphics. Also, the hard keys are a nice touch. Climate control in the Hyundai Ioniq is incredibly straightforward with its clearly-labeled buttons and two physical knobs that allow you to control the vehicle's temperature. Dual zone automated climate control is standard on the Ioniq, and it does a phenomenal job at distributing the appropriate air temperature throughout the cabin. You will not find yourself sweltering in the summer or freezing in the winter. Getting into and out of the 2019 Hyundai Ioniq is made fairly simple thanks to the lengthy front doors that open out wide.The downplayed seat bolsters and low sills help with getting in and out as well. Even accessing the narrower rear seat is easy for children and smaller adults, whereas even they might struggle with doing this in other vehicles in this class. Without a sunroof to limit head space up front, the driver and front seat passenger can enjoy sitting in a spacious cockpit without needing to duck their heads down. Knee, hip, and elbow space is also to be found in plenty up front. In the rear, head room is slightly more lacking, which is typical for a vehicle in this segment. However, there is enough room to keep the knees of taller passengers from knocking into the front seats. Overall, the cabin offers a good amount of space that many of its rivals struggle to create. The 2019 Hyundai Ioniq has a touchscreen display that, even though it sizes on the smaller side, is delightfully and appropriately responsive. Whether you are using the standard 7-inch touchscreen or the upgraded 8-inch version, you will not have to press down on the buttons multiple times to get the function you want to work. You can swipe across the screen and get a reasonably prompt and accurate response. Infotainment features abound on the new Hyundai Ioniq. Bluetooth connectivity comes standard and is incredibly easy to use. Smartphone app integration via Apple CarPlay and Android Auto is also standard on every trim level, and they are superior in functionality to the Ioniq's built-in voice recognition system. The native voice recognition system does respond appropriately but only caters to a few basic functions. One of the most problematic issues facing hybrid vehicles is that their braking systems tend to end up feeling a bit unnatural. Unfortunately, this does hold true for the 2019 Hyundai Ioniq. The pedal feels far too light and spongy, and the friction and regenerative brakes do not mesh well together. Drivers will feel the transition between one to the other. There is also a significant amount of nosedive when you have to come to an emergency stop. Some drivers might not feel terribly confident in the brakes because of this issue. Seating in the new Hyundai Ioniq could feel pretty uncomfortable for a lot of occupants. The seat cushions have flattened bottoms that do little to provide lateral and lower thigh support. Seat backs on the front seats feel adequately cushioned and covered by the cloth upholstery, but the rear seats are simply too firm for comfort. Regardless of where you sit in the Ioniq's cabin, you will likely find yourself squirming in discomfort after an hour or two of remaining seated. To add to the seat discomfort, the ride quality on the 2019 Hyundai Ioniq is not as cushy as what you will find in some of its competitors. When you go over a lumpier patch of roadway, you will feel the vehicle being jostled up and down. In addition to being rather busy, the Ioniq can also feel like it is floating, which might make those who are prone to experiencing motion sickness regret riding in this car. Lastly, to further compound the discomfort you might experience inside of the Hyundai Ioniq, there is the road noise issue. Although the engine does not get terribly loud, an obnoxious and intrusive amount of road noise manages to seep its way into the cabin. Take this vehicle up to speed, and you will really notice it. Drivers will likely have to turn their music up a little louder than they would like just to be able to hear it clearly enough over the road noise. As has always been the case, the Toyota Prius leads the pack in hybrid vehicles. The 2019 Hyundai Ioniq will undoubtedly face stiff competition from the 2019 Prius, which looks sportier than ever before. Unfortunately, the Prius falls behind the Ioniq in terms of fuel economy. For example, the hatchback Prius c only gets 48 mpg in the city and 43 mpg on the highway. However, the Prius does price very competitively and is loaded with a bunch of desirable features, including Toyota Safety Sense. The Hyundai Ioniq also faces steep competition this model year from the 2019 Honda Insight. The Insight gets up to 55 mpg in the city and 49 mpg on the highway, putting it right in line with the Ioniq. Unfortunately, unlike the Ioniq's rather well-mannered powertrain, the one on the Insight gets a little too busy. Still, this does not take away from the compliant ride quality that echoes what you get on the Honda Civic. Also, the interior - including the cargo area - is well-designed and maximizes every square inch of space that can be mustered up. 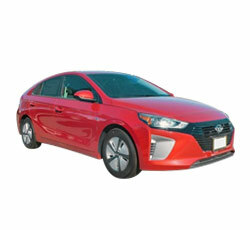 The 2019 Hyundai Ioniq is not the perfect vehicle, but it does have some characteristics that make it stand out in a hybrid segment that is becoming more saturated with vehicles every year. While it is still tempting for a lot of people to get a Prius, the Ioniq performs just as well, if not better in certain aspects, than the old fan favorite. Its fuel economy is the best in its class, and the simple accessibility of the vehicle's technology is tremendous.